Preheat oven to 200°C/400°F. Bring a large pot of salted water to a boil. Meanwhile, slice off stems and top one-third of the artichokes. Transfer to boiling water and cook for approx. 15 – 20 min., or until stems are tender when pricked with a knife, then drain. Cube bread and roughly chop pine nuts. In a large bowl combine bread, pine nuts, softened butter, and thyme leaves and mix until combined. Set aside. In a small saucepan, warm cream and goat cheese over low heat, stirring until smooth. Remove from heat, continue to stir, and add egg yolk and Parmesan. Season with pepper to taste. Scrape out fuzzy center and purple prickly leaves from centers of artichokes. 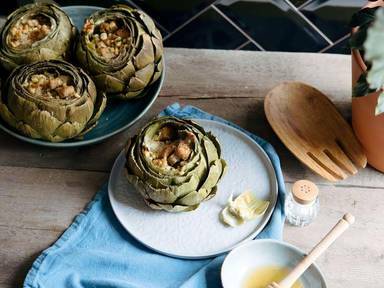 Transfer artichokes to a baking sheet and fill the centers of each halfway with cheese sauce. Sprinkle bread crumb mixture evenly over each. Bake artichokes at 200°C/400°F for approx. 10 – 15 min., or until cheese is bubbly and breadcrumbs are golden brown. Season with salt and pepper to taste. Drizzle with honey. Enjoy!